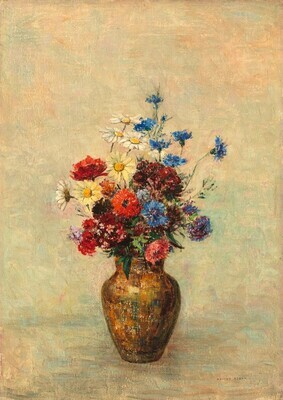 Private collection, Paris, by at least 1959, possibly Jacques Laroche [1904-1976]; by whom sold 1965 to (Wildenstein & Co., New York); sold 20 January 1966 to Ailsa Mellon Bruce [1901-1969], New York; bequest 1970 to NGA. Lent to an exhibition in London in 1959 from a private collection in Paris. See letter dated 13 August 1999 from Wildenstein's, in NGA curatorial files. Invoice from Wildenstein and Co. to Ailsa Mellon Bruce dated 20 January 1966, copy in NGA curatorial records. Impressionist and Post-Impressionist Masterpieces from the National Gallery of Art, Washington, State Hermitage Museum, Leningrad; State Pushkin Museum of Fine Arts, Moscow, 1986, no. 26, repro. Masterpieces from the National Gallery of Art, Washington, Kyoto Municipal Museum of Art; Tokyo Metropolitan Art Museum, 1999, no. 72, repro. European Paintings: An Illustrated Summary Catalogue. National Gallery of Art, Washington, 1975: 284, repro. Small French Paintings from the Bequest of Ailsa Mellon Bruce. Exh. cat. National Gallery of Art, Washington, D.C., 1978: 34, repro. (continuing exhibition beginning in 1978). Walker, John. National Gallery of Art, Washington. Rev. ed. New York, 1984: 515, no. 772, color repro. European Paintings: An Illustrated Catalogue. National Gallery of Art, Washington, 1985: 328, repro.